About an hour from the city just off the Bangkok-Chonburi motorway, Bangpakong Riverside Country Club is surely one of Bangkok's best value for money courses. At over 6,600 from the white tees, it's quite a challenge for the weekend hacker, but many of those holes are doglegs and if you're a big hitter the course plays considerably shrt as you can drive it over many of those doglegs. Course conditions are surprisingly good for the green fee the charge (THB 700 weekdays until end of 2006), and there is an excellent variety of holes to suit all styles of play. Tee boxes are level, greens are consistent, and this is a course that could charge a lot more if it were a little closer to the city. The lack of people weekdays is definitely a draw-card and Bangpakong Riverside Country Club has leapt into the top 10 in Bangkok category. 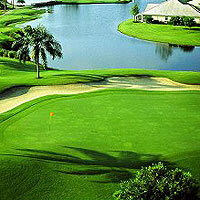 Amazing 700 baht weekday green fee until Dec 2006, play all day, can't beat that. Good caddies, nice restaurant with outside seating overlooking the 1st tee and 9th and 18th greens. Pleasant check-in staff and overall a very enjoyable days golfing for 5/5ths of F all.